Predictably, the United States Senate and House of Representatives voted to support Israel’s carnage in Gaza thereby handing the new President yet one more war to contend with, one unhappily more dangerous to America than those in Iraq or Afghanistan. That may seem to be, on its face, a strange thing to say unless one understands that we are in Iraq fighting for Israel and, with this vote, our Congress has indebted itself to the Israeli forces that govern the United States (as Ariel Sharon said long ago), forces that will use endangerment of Israel as leverage to attack Iran and Syria, countries already in their military sites since 1992. Our Senate’s indebtedness is unanimous; while 20 in the House abstained and five voted against the resolution, all the rest voted to support. The reasons offered: Israel has a right to defend itself even though we do not know where Israel is: that is, Israel has yet to define its borders and remove itself from occupied territories; and the rockets fired over the last 8 years must stop, even though Israel, with one shell in Gaza, killed 43 at the UN school, twice the number killed by rockets in 8 years. But logic, international law and international opinion, and fundamental moral law cannot sway our Congress; money can and does. Obama may have a Senate majority and a Democratically controlled House of Representatives, but he cannot respond to the desires of the American people for change – no more wars – nor to the United community of nations that have voted with their feet against the actions of the Israeli government in open and defiant dissent against their governments in London, Ireland, Scotland, Europe and through out the Arab world including Jordan and Egypt. Our Representatives represent Israeli wishes and policies not those of the American people; the people voted overwhelmingly for change not the continued support of Israel represented by these votes or the appointments made by Obama as advisors. Ironically our “only democratic ally” in the mid-east, as constantly reiterated by our mainstream media and talking heads, has locked the media out of Gaza in order to isolate truth to its Public Relations campaign begun the day it invaded Gaza three weeks ago. Consequently, Americans receive their news from those that decided to break international law and their own responsibilities as an occupying force under the Geneva conventions. No truth, no morality, only raw force serves this Zionist nation beholden only to itself and those it owns, including our Congress. Yet the news gets out. The people of Gaza transmit the truth by phone cameras and a handful of Al Jazeera journalists that report from the killing fields. These pictures inundate the Internet and even a European press on occasion. Contrast the reality of the coverage with that provided to Americans. In Sderot, the little town used by Israel to portray its misery, devastation, and ultimate demise at the hands of the “terrorists,” the citizens have taken to the hillside overlooking Gaza — binoculars, sunglasses and beach chairs in tow — to watch the rain of Israeli terror by air, sea and land on an imprisoned people. (Shashank Bengali, “Israelis, sipping Pepsi, watch bombardment of Gaza town,” 1/5/2009, McClatchy). Are they in danger? Perhaps, although they do have bomb shelters and warning sirens, something that the people of Gaza do not have. And as I have noted elsewhere (in Counterpunch, 1/5/2009), they have been bombarded on average with 2 rockets per day for 8 years. Twenty three have died over these 8 years, an unsupportable number killed by meaningless use of force. Nonetheless, this has become the rationale for Israel’s current killing that now approaches 1000 half of whom are children. Disproportionate? Not to our Representatives. Now consider what we are not shown, an image that the western media finds “pornographic,” “irresponsible journalism,” “too graphic,” “too emotional” for public consumption; yet the rest of the world sees these images, hundreds and hundreds of them. This alone should give our representatives pause to reflect on how their subservience to the barbaric behavior of Zionist Israel plays out in the world that is not controlled by American corporations or complicit congressmen. You can go to www.al-ayyam.ps/znews/site/pdfs/7-1-2009/p01.pdf. There you will see the head of a little girl looking forlornly though vacant eyes, mouth still open, completely buried from the neck down in rubble from her crushed home; indeed, too graphic, too emotional to contemplate, just another unnamed casualty of war where death happens … unfortunately, and “we’re sorry.” This appeared in multimedia, a Norwegian site, where you can also hear Sven Egil Omdel, the Director, explain why he decided to publish the photo even though it is against policy: “It is (the publication) a conscious provocation and we have two reasons for it: Israel keep (sic) all western journalists away from the war in Gaza. … The most important reason for us to show this face, is that the Arab world sees pictures like these from Gaza every day. Not a single still, but hours and hours of TV images of hospital floors full of small, dead bodies. Four year olds, two year olds, seven year olds, newly borns – These pictures represent the war in Gaza for millions of muslims – and we wonder why the hatred against Israel and the west grows? (translation)” This now is Obama’s war whether he wants it or not including the 3000 tons of ordnance being shipped now to Israel by the United States to supplement what they are currently using in Gaza. Americans must understand the timing of this “war” that is not a war but a slaughter of caged people that have no where to hide, no where to go and even then, when following IDF orders, find themselves in a building targeted for destruction, their destruction. Deceit governs; racism motivates; hatred compels and greed for others’ land is the bed rock of action. Why now? 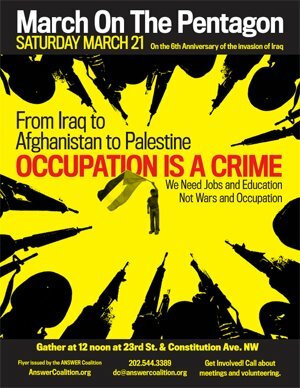 For two years, during the election campaign for the US Presidency, Israel imposed a siege on Gaza, a calculated act of slow, insidious decimation of the people planned in 2004 (www.infoimagination.org) to ultimately compel the Palestinian people to submit to Israeli dominance, without a state, without an army, without freedom of ingress and egress, unclassified and wholly dependent on Israel. Included in that strategy was the need to complete “Securing the Realm,” the document drawn up by our faithful Neo-Con “servants” that drove the policies of Bush’s administration and called for regime change in Syria and Iran in addition to Iraq. During the political campaign, while press coverage crowded out virtually all other news, the Zionist forces destroyed the infrastructure of Gaza, began the locking down of gates and the slow but methodical destruction of Gaza’s economy. Simultaneously they sought, but failed to get in time, Bush’s approval of attacks on Iran’s nuclear sites. Now, as the days of the Bush reign of terror ends, they are desperate to force Obama into a continuation of absolute and unquestioned support of Israeli policies in the mid-east. With the Congress in hand, with the vote made public in America and its continued commitment made known to the world, they believe that hey have locked Obama in a prison not unlike that surrounding Gaza. What now? Reflection on the past few years, since 2005 to present, especially in the United States, makes possible this observation: the people of the United States and the people of Israel no longer see eye to eye on matters of mutual concern and, indeed, have already expressed that reality in fact. What do I mean? Beginning with the Downing Street memo and the disclosures of Richard Clark and Ambassador Wilson, the ability of the main stream press to hide the truth from the American people could no longer hold. As 2005 evolved, more and more disclosures unraveled the lies protected by the “fair and balanced reporting” of the corporate owned and controlled media. Fair and balanced was neither fair to truth nor balanced. To put two items on a scale, one for, one against, does not present truth or a balanced report. It simply shows two different perspectives, one for and one against. But as facts and documents became available to the American people, items available over the prior years on various Internet publications, the American people reacted by throwing out Bush supporters in the 2006 and 2008 elections and Bush support eroded into the mid-twenties. They wanted “change” promised from the start by Senator Obama and mimicked eventually by most of the other contenders to the throne. Change meant getting out of Iraq immediately and return to a government that had a concern for America, including less absolute and blind support for Israel. The vast majority of the American people do not accept the disproportionate and cruel invasion of Gaza by Israel. As more and more pictures and videos become available on the Internet, especially the recurring images of savagery on You Tube, the American people are traumatized by the horror, especially the uncountable number of deaths of children. Our representative government does not represent the American electorate; it represents only scared politicians who depend on AIPAC money, men and women who fear for their political seats regardless of what their constituents believe and want. By contrast Israeli citizens are faced with an election that has all three contenders fighting to convince the electorate that he/she is the one that will inflict more force to subjugate the Palestinians to Israeli will. The focus of this campaign resonates around the war monger Benjamin Netanyahu; both Livni and Barak must demonstrate that they are better leaders to take Israel against the Palestinians, the Syrians and the Iranians. Israel’s future is one of continued war which means in turn continued American billions to sustain their ambitions against their perceived enemies. They do not talk of “talk” with neighbors, only unending war against those that oppose the Jews. One does not speak of Israel as a state or government when “victimhood” is needed to induce unyielding support for the Israeli governments need to acquire more land and control the regimes of its neighbors, one must turn to the bias against Jews that is world wide and endemic. Sympathy cannot be rung from criticism of a government’s policies. Horribly, the invasion of Gaza can be viewed quite accurately as a campaign war where Livni and Barak have made evident to the electorate that they will use force to ensure Israel’s right to dominate the area regardless of international pressure and opinion, international law or international justice. They know they can do this because they have control of the American Congress and administration including the veto power of the United States in the Security Council. World opinion means nothing. The Israeli electorate, with modest exception, does not want change. Ultimately, it’s AIPAC’s will against the American citizens’ expressed desires as they voted for this man of change. Who will win? Will the blatant exposure of Israeli violence and mercilessness, in pictures and videos, turn the tide? Can Israeli hacking of Internet sites like that done to The Palestine Chronicle and the attempted erasure of sites that contain the pictures and videos described above stop the flow of sympathy for the plight of the Palestinians in Gaza and quell the building animosity that has arisen world-wide against the cruelty employed by Israel in its savage destruction of Gaza? Will Obama turn to diplomacy, as he preached when a candidate and, thus doing, fulfill the truth enunciated by Phillip, “Become more human, and humans will love you”? Will he turn to negotiations with those engaged in these brutalities, to stem the violence? Will he recognize the impossible absence of the democratically elected Hamas government from deliberations with Israel over Gaza? How absurd. Will he reconsider the bribery that Bush employed to keep Egypt and Jordan in collusion with Israel despite the agony the people of Egypt and Jordan experience as they watch their people die in Gaza? Will he seek justice by returning to the resolutions of the UN that demand Israel return to the borders of 1948 or 1967, to leave the occupied lands of Palestine including East Jerusalem, to recognize the right of return of the refugees, to realize that Palestinians have a right to their state just as Israel has a right to its, something recognized by Hamas though never recognized as true by our main stream press. (Guardian, 1/12/2006 and Ynet, 1/30/2006). Will Obama seek peace that America might be free of its entanglement with a rogue state that blindly leads America into the darkness of unending conflict and death? Will he demand of Israel that its support from America depends of its recognition that it can only survive if it lives in harmony with its neighbors not out of fear but out of brotherhood? Will he suggest that the Israelis consider a diametrically opposite road to peace, one that understands “People will love you if you become more human”? As an American who voted for Obama and for “Change We Can Believe In,” I agree that AIPAC and WINEP have hijacked the American political process in the most nefarious way. The US has not been an honest broker in the Middle East (especially in Palestinian peace process) for at least two decades, during which time, the Israeli lobby has managed to stall the process and build up settlements. The offensive in Gaza is a game-changer. When the IDF killed 1,400 people, it overplayed its hand. Operation Lead Cast opened the eyes of the world to the apartheid that is happening in Palestine, which is being funded by our US taxpayer dollars and explicitly approved by our bought-and-paid-for Congress. There is hope, though, that this time, things will be different. Obama is not putting WINEP-AIPAC people in key positions, particularly Dennis Ross (“Israel’s lawyer”). George Mitchell and Chas Freeman are both emblematic of the change promised by Obama, and the visit by three elected officials to see Gaza first hand (Kerry, Baird and Ellison) was the first time in nearly ten years that the US has sent members of Congress to see the devastation first hand. It is very unsettling to have the grandchildren of the Holocaust committing a Holocaust of their own in Gaza. No amount of hasbara from the IDF mouthpieces will change that cold, hard fact. how widespread was the ‘knowledge’ in US that “the only good injun was a dead injun”? how about the ‘knowledge’ that the only good pal’n is a dead pal’n? in US, 98% of pols probably think so but are afraid to say it. ca. 95% of world jewry and christians want, i guess, ?all pal’ns out of israel. the puzzle appears to be [ or does it appear to be? ] that israelis have not as yet expelled pal’ns. what’s the hold up? is it only oil? or oil and warfare? It is indeed true that the general public doesn’t know anything about the reality of the situation, and they think that the Palestinians have to “get out of Israel’s land”. Ignorance is indeed a horrible thing.